I only like to shop if it is one of two ways, thrifting or online. Don’t take me to a mall or a grocery store because I’ll be bored and frustrated (obvious exception being Target because I have a soul), but take me to a big thrift shop or give me a computer I’ll be a crazy happy shopper. I love thrifting because you can find unique items at reasonable prices and online shopping is awesome because you can price shop and read reviews. I really don’t shop any other way so it is logical that I would want to combine my two loves. The essence of thrifting is hunting for unique items that are marked with prices that are negotiable but unfortunately that experience doesn’t translate well online. Well, fear not! Because there is a sliver of hope for those of you who love thrifting but are too lazy to leave your house (we’ve all been there). This post is all about finding unique items at good prices all from the comfort of your home. The obvious first answer to online thrifting is craigslist. It’s true, you can’t have items shipped to you and there is some human interaction involved, but the selection is vast, the prices flexible, and all you have to do is pick up. 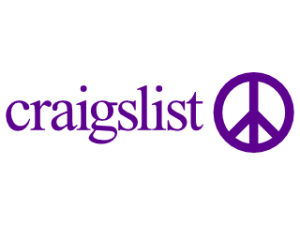 I’m a huge craigslist fan because it is like garage sale-ing without all the driving around looking at crap. I can spend five minutes a day for a week searching ‘dressers’ and I’m pretty much guaranteed to find something I like for a good price. I can ask questions about the item, negotiate price, and schedule a pick up time all online. This isn’t technically online shopping which would involve a shipping option but it is a heck of a lot faster and more efficient than spending an entire Saturday morning driving around going to yard sales and thrift shops hoping you find a dresser that you like. Another good option is Etsy. While known for handmade goods, Etsy also has a large selection of vintage items. You can search ‘vintage lighting’ and find all sorts of cool options in a wide range of prices. The down side? You will pay for the convenience of having a vast selection of highly curated items to choose from especially once you add in shipping fees. But if the idea of searching high and low throughout the city for old leather suitcases (or whatever it is your heart desires) stresses you out then maybe paying extra is something you are willing to do. Online auctions likes Ebay and Shop Goodwill can also offer you a thrifting-like experience, especially with the ability to price haggle. Of course, there is more risk involved since you may not get the item you want, or worse you over pay, but there are similar concepts involved. Auction sites are great for the specific and rare items you would hope to find while thrifting but don’t have the time to search for every weekend. If you are extremely lazy or maybe it’s just super smart (let’s go with super smart) you could email or message a thrift shop near you to do the work for you. Don’t know what I’m talking about? Let me give an example. A few months ago a friend and I went the Indie Arts & Vintage Marketplace (you should go! ), she was looking for a specific item which she amazingly found… except that it was already sold. She was disappointed, but what can you do? Well, what you can do is ‘like’ that seller on Facebook and message them saying, “Hey, I liked this item that you sold, if you ever get another one let me know!” Guess what my friend had a few weeks later? Yep, the item she wanted and all she had to do was send a one sentence message (she’s really smart). So if you are looking for something specific and you don’t want to waste your time shopping all around the city or pay for it to be shipped from Australia, the next best thing is to ask an expert and maybe they will find it for you. It never hurts to ask! If you don’t know what sellers to contact check out the Indie Arts ‘Exhibitor List,’ it’s a great starting point. Bottom line is this: thrift shops are a unique animal and the internet can’t compete. I know that’s a big statement to make since the internet is infallible after all, but sadly it’s true. You can definitely find awesome and unique stuff online but you are probably going to pay for it. And there are lots of great deals to be had on the internet if you look hard enough but they may not be the most unique items. If you compromise on price or uniqueness you may be able to find some cool stuff, but nothing beats the experience of sifting through a huge room full of crazy items to find the one plaid wool blanket that fulfills all your desires and only costs $3.00. Thanks Maren! I’ll definitely try and contact her. You can include blingdaily,com also in your list. I have purchased the items from them so many times with full satisfaction.